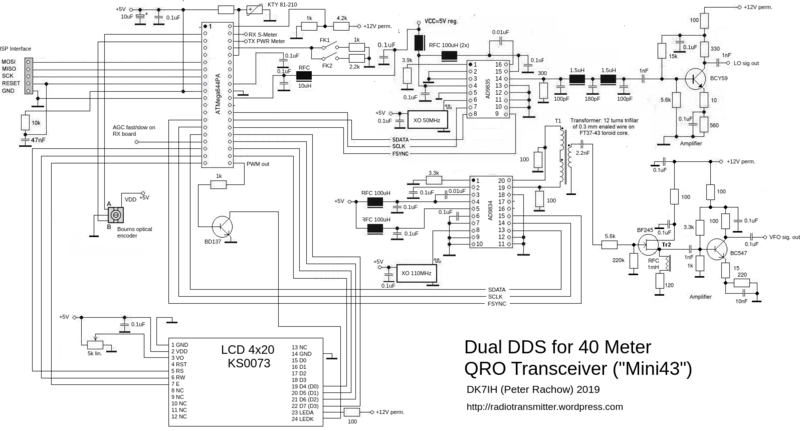 In my last article I talked about my ideas fo a new transceiver project beyond the QRP level. First pictures of cicuitry were also shown. In the meanwhile the transceiver has been finished, some minor changes had to be made and now it’s time to go to the details. All construction objectives (compact size, sufficient output power to establish even DX contacts on 40 meters, good stability, good receive performance, rigidness for outdoor use) have been met so far as I can say. I had the rig with me, when I was on vacation on the Island of Jersey (GJ/DK7IH/P) from 12th to 19th of August this year. It was big fun operating the rig. Lots of stations were calling during the two days when I was on 40 meters. ODX was HL1AHS, OM Kun from Seoul. So, this was very nice for 50 watts and a vertical antenna made of a fishing rod. 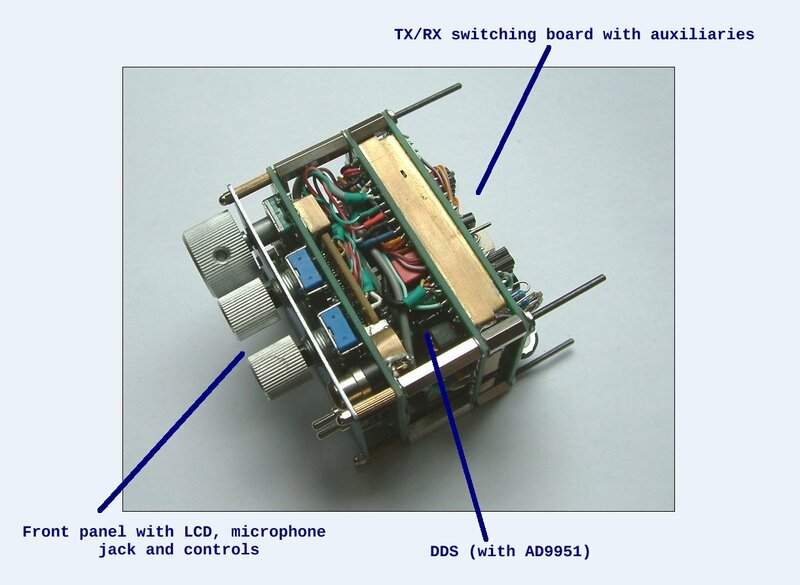 First, to give an overview, let’s have a look on the completed transceiver. Cabinet size is 7.5 x 16 x 6 centimeters. The next posts will describe the rig in details step by step. Proceed with the receiver’s front end. On one hand sunspot cycle is on the decline. Conditions on the higher bands tend to deteriorate gradually. On the other hand I wanted a very compact transceiver for outdoor (particularly holiday) activities. Besides this and due to the fact that I prefer monoband operation when on tour, the potentially ideal band had to be found. Based on these prerequisites I made up my band to go to 40 meters for this project. 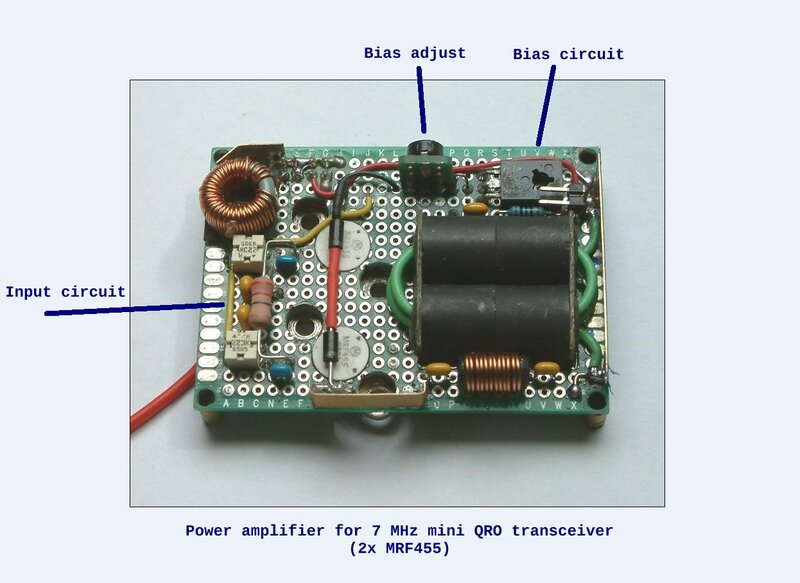 Some interesting concepts for QRP-transceivers for this band can be found on the web. The “Santerre” and the “ILER40” should be mentioned. These operate with power levels of about 5 watts which I thought should not be enough in most of the situations. 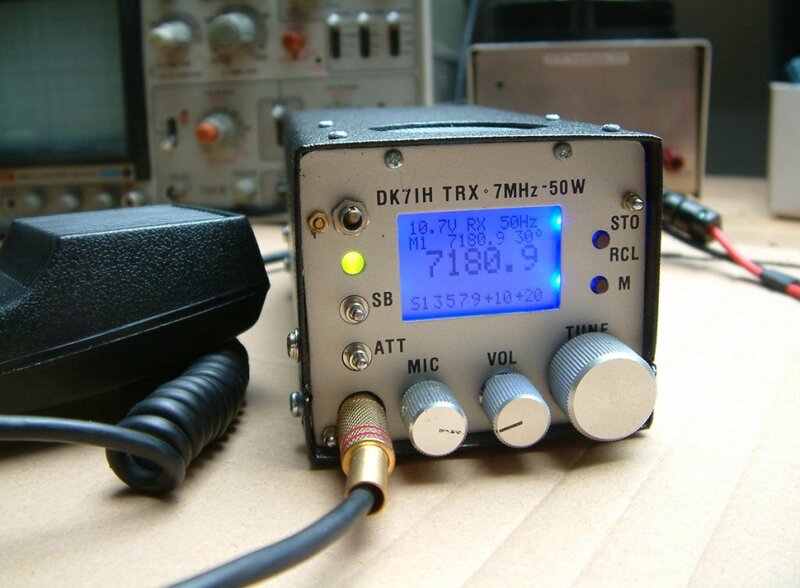 My opinion is, that on 40 meters it’s not the best decision to operate on the standard QRP watt level, e. g. like the mentioned before and my other rigs have been designed for. With high probability you’re about to get lost in the naturally higher band noise and QRM that is around on 7 MHz. Thus, 50 to 70 watts possibly should be a more suitable power level to operate on. From the electronic point of view this transceiver doesn’t involve very much new stuff. The 4-stage transmitter with push-pull driver and final from my multi-band rig with emitter degeneration circuitry in every stage to improve linearity but without negative feedback in this circuit. Some NE612/SA602-mixers in receiver and transmitter, MC1350 as the rx’s if-amplifier, LM 386 as audio amplifier, busines as usual. DDS with AD 9551 for frequency generation. No fuss, no SDR-stuff. “Old school” homebrewing. Not more, but not less. The challenge this time was to increase package density once more to an achievable maximum. The maximum size I wanted to have was the size of a carton of cancer sticks, also known as “cigarettes”. 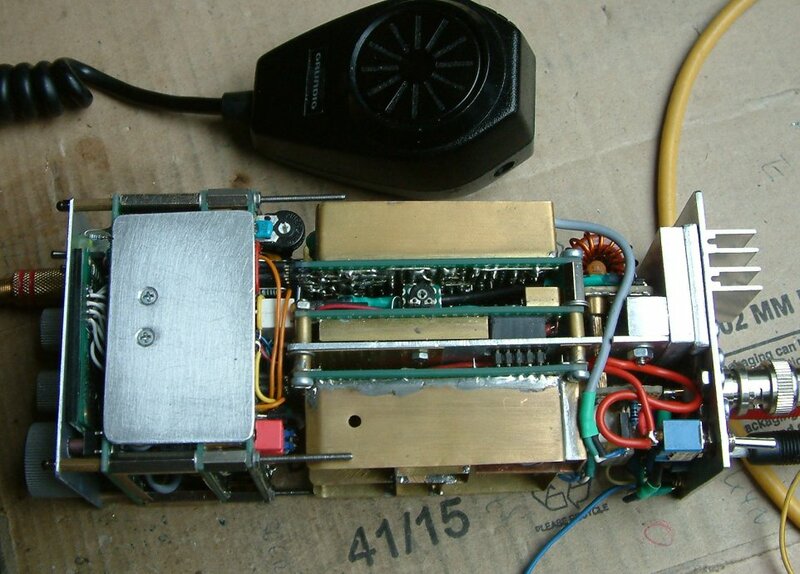 Another problem of the project was to get a high power rf amplifier with an output level very much beyond standard QRP and avoiding any unwanted coupling, parasetic oscillations etc. even when components are very densly packed. A clean signal is a must, not of the package size. rf board with SSB generator, tx mixer, pre-amp, pre-driver and driver (push-pull). 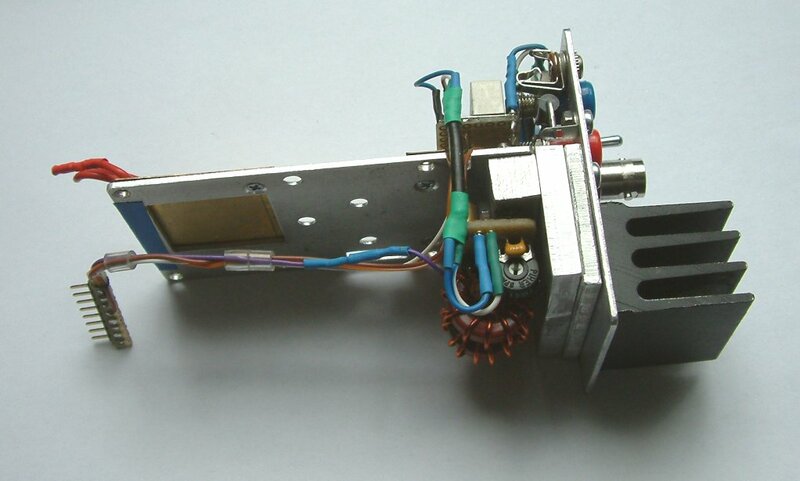 The aluminium plane centered will keep the PA 50 to 70 watts board. This one is equipped with two MRF455 rf power transistors made by Motorola. Above and below this board the receiver and transmitter boards are mounted to a three layer package. Both construction groups are joined in an angle of 90° by a set of plugs and sockets so that they can be put apart easily and fast for service or improvements. All boards are made of 5×7 cm “FR4” material Veroboards. 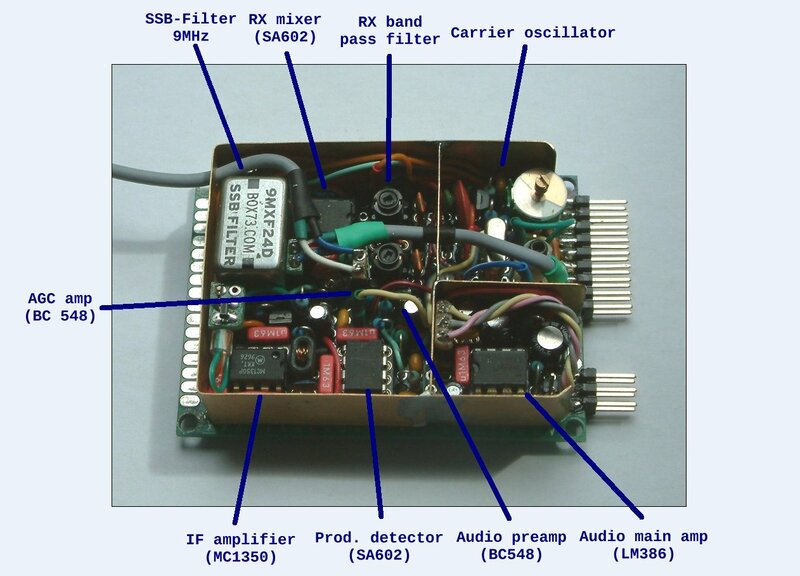 In the center of the right board package you can see the PA amplifer, capable of delivering 50 to 70 watts SSB signal, on top the rx board, at the bottem the transmitter board. 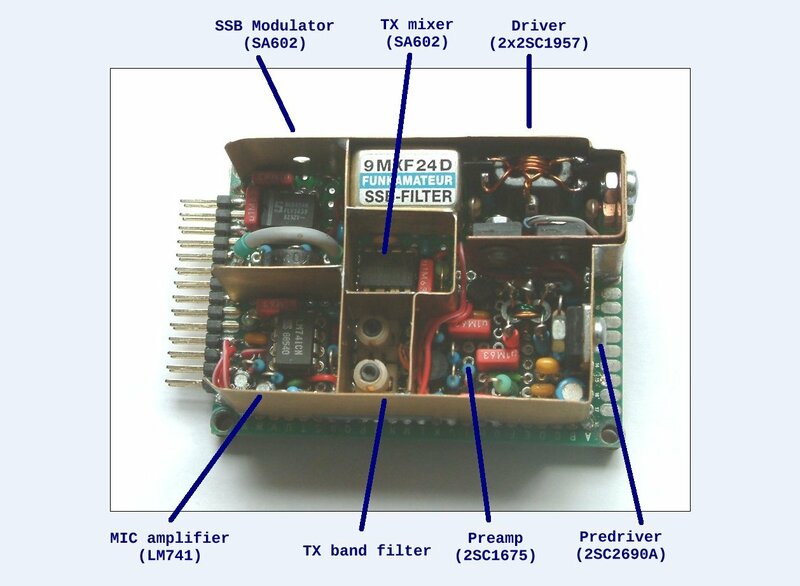 An important issue for a high power transceiver is the transmitter’s final amplifier. Particularly thermal conductivity should be kept in mind. In this case one problem, I thought, might occur because the power transistors are not mounted directly to the rear panel of the transceiver where heat can be lead to the outside easily. Here, the two MRF455s are sited in the center of the sandwich construction holding the 3 main rf boards. 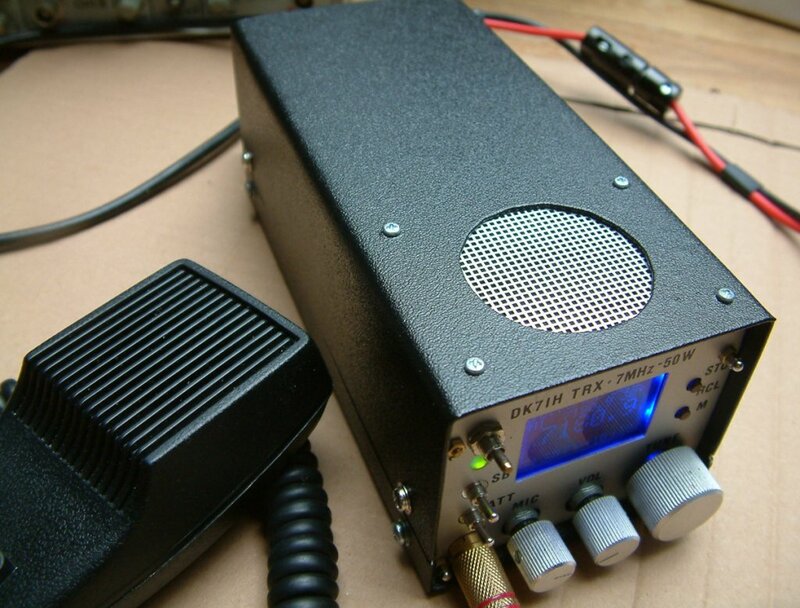 But as this transceiver is for voice operation only with its comparatively low duty cycle of 10 to 20%, this was not considered as an unsolvable problem. But thermal aspects must be kept in mind, anyway. As you can see, the final transmitter stage is based on an aluminium sheet metal of 2 mm thickness. Under the board there is a second layer also of 2 millimiter thickness aluminium. By the rear end it is joined to a solid piece of square shaped aluminium rod that itself is connected to another two thick layers of alumium which are srewed to the rear panel holding a heat sink. For this heat sink I’m currently searching a more massive one. The thermal test was a longer QSO with Dave, M5AFD . During this longer QSO with transmission times of up to 3 to 4 minutes each the center alu panel got a temperature of 60° to 65° centigrade. Thermal stress? Not worth mentioning yet! So far I’ve done about 50 QSOs on 40 meters with this rig, gradually improving some things. Later I will publish the detailed scheme as soon as it is finished. By now prospects are good to bring this compact QRO transceiver with me on a holiday trip to Jersey Island planned this summer.